Ariel Kachuro/Pipe Dream Photographer Redshirt senior attack Brianne Arthur finished her five-year Binghamton career with over 100 goals and a .441 shots percentage. The Binghamton women’s lacrosse team’s 2018 season was one for the history books. The team compiled a program-record eight wins and put together the best America East (AE) Conference record in school history, at 5-2. Most significantly, the Bearcats advanced to the AE Tournament for the first time ever by placing within the top four spots of the AE standings. While many Bearcats made significant contributions to make these successes possible, none had a greater impact than redshirt senior attack Brianne Arthur. Arthur led the team in goals scored by a wide margin, tallying 45 over the course of the season. She led the team in points, shots and shots on goal, as well as also putting together 10 hat tricks in 17 games played this season. For Arthur, though, the road to this successful season was a long one and not without setbacks. Following successful freshman and sophomore seasons, Arthur was sidelined with an injury for the next two seasons, missing all but three games over that span. It was the time spent on the bench and the hard work put into making a return that Arthur credits for the prolific season she had in 2018. Arthur’s involvement in lacrosse dates back to her elementary school days, when she took advantage of the many opportunities to play in her hometown of Watertown, New York. Becoming involved in the sport was a matter of family tradition for Arthur, as both her father and older brother played lacrosse as well. It was when she entered high school, however, that Arthur began to consider extending her lacrosse involvement to college. When Arthur visited Binghamton University’s campus, it was love at first sight. 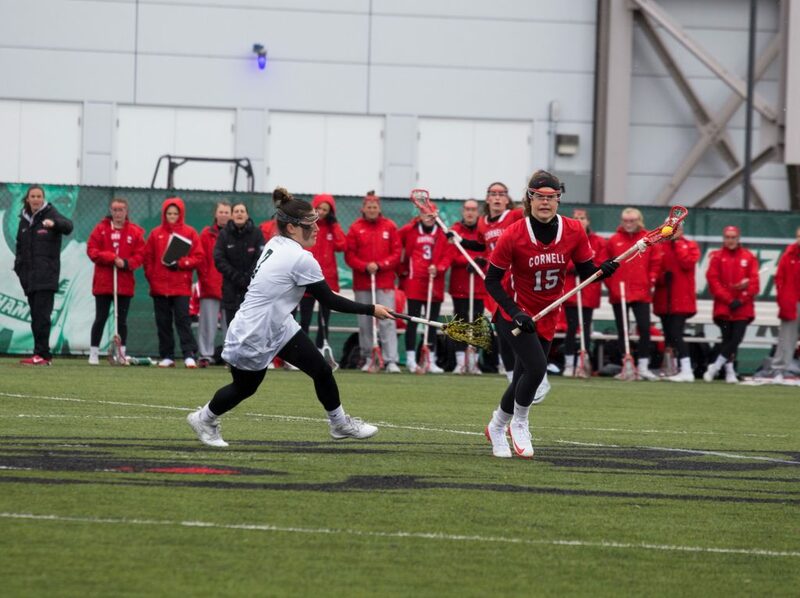 The proximity to her hometown and welcoming atmosphere made BU the ideal place, in Arthur’s view, for her undergraduate studies and college lacrosse career. She committed in her senior year of high school. The choice has worked out very well for her, as the BU atmosphere has been one in which she thrived as a player. Over the course of her five years, Arthur amassed 106 goals, 126 points and 152 shots on goal. Most notably, Arthur was named to the 2018 second all-conference team at the AE Tournament Banquet. In the immediate future, Arthur plans to attend graduate school with the ultimate goal of becoming an elementary school teacher, where she can put her passion for working with young kids to good use. She also doesn’t plan on straying too far from her love of lacrosse, though, as she has an interest in pursuing coaching at the high school or collegiate level one day. Being a redshirt senior, Arthur already finished her undergraduate studies last semester, majoring in history with a minor in education. With last Friday’s loss to Albany, Arthur’s time in a Binghamton lacrosse uniform came to an end, but she looks back on her college career with nothing but fondness.